You are currently browsing the category archive for the ‘homegrown’ category. I’m not quite sure what happened to the month of September…or June, July and August, for that matter. Although if you could see me right now, you might be able to figure out the answer to that question on your own. I’ve been putting a lot of my energy towards my latest from-scratch creation. Not a cake, not a pie, but a new, tiny human. He’ll need about four more months in the oven before it’s time to emerge. There is also the search for a more spacious home – say, one with enough floor space for a baby to practice crawling without running into furniture every two feet. You can blame the hormones, but I’ve never had this much trouble finding a place to live. Fortunately, the hunt has paid off and we’re about to sign a lease on a tiny house with a yard. A yard! And a washer and dryer, hallelujah! Oh, and in case I didn’t feel busy enough, I’m a first-round panelist for the Cybils this year! Last year’s second-round reading didn’t keep me busy enough, so obviously this year I need to go all out and sign up to read All the Books (well, all the middle grade fantasy and science fiction, at least). I’m super excited about it, and hopefully that will inspire me to post more regularly about the middle grade gems we’re reading! If you read children’s or YA books, go and nominate your favorites – you’ve got until October 15! 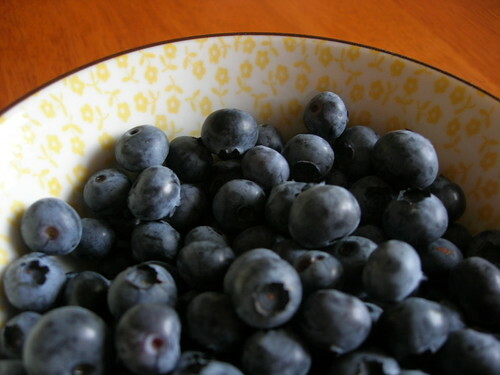 That’s the sound of a summer morning spent at picking blueberries – although of course, dropping them into a Pyrex dish or recycled yogurt container doesn’t produce quite the same noise, and fortunately there were no bears to interrupt us or distract the small children. Unfortunately, I was too busy stuffing my face and filling my containers to get out the camera. Rest assured that the kidlets were a laugh and a half – making up silly animal names, discussing the methods of the Blueberry Monster (which they hastened to assure me was entirely imaginary), and whether we would run into any bears. The youngest child stowed some berries in her pocket, and took frequent snack breaks while walking to the park afterwards. It was, all in all, exactly what a summer morning ought to be. I feel like I’ve seen a few conversations online lately about favorite summer books, or books that evoke summer. Blueberries for Sal is definitely in my top five, especially since blueberry picking is usually a major feature in my summers. Another one is Tasha Tudor’s fantastic Becky’s Birthday – I haven’t seen a copy of it in years, but it was a favorite as a child. I loved all things old-fashioned, plus I have a summer birthday, like Becky. The peach ice cream! The picnic! I wish it were still in print – I might have to make a trip to the downtown library to take a peek at their copy, which doesn’t circulate. I grew a potato! Now, it’s no enormous potato, but it IS a potato. There may be more in the garden, but I only excavated the plant that had fallen over and looked dead (isn’t that when you’re supposed to harvest potatoes?) I never realized how easy it is to grow a potato. Here’s the life cycle of my potato: I bought a bag of local, organic small white potatoes at New Seasons. I ate most of them, and the rest of them sprouted before I got around to them (this happens to me constantly – I can never seem to finish my potatoes, no matter what quantity I buy at a time). So I cut them up, leaving a couple of eyes per piece. I left them out on the counter to dry for a few days. They looked hideous. Then I planted 4 or 6 of the least scary-looking ones in our garden bed, not expecting anything to happen. A while later I noticed these strange plants in a corner of the garden. I thought they might be weeds, and was about to pull them out, when I realized they were growing in two rows, just like I’d planted the potatoes. Victory! They’ve slumped pretty quickly – I don’t know if this is normal or not – so today I pulled one up, and voila, one leetle tiny potato. Also doing well in the garden are sunflowers – the first one just bloomed – and the dill just went to seed. The tomatoes have blossoms, but since I’m moving at the end of the month, I doubt I’ll get to eat any – a pity, since I tried some new varieties this year. I haven’t killed the sage yet, and my succulents are, as always, thriving. In other news, my bike is back from the repair shop and I can’t wait for some free time to roam the streets. I was walking the Springwater Corridor trail last weekend and envying all the cyclists who whizzed past. 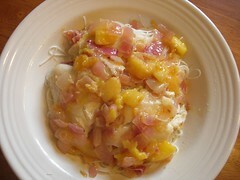 This week’s recipe was borrowed from nerd’s eye view – mango tilapia from one of her Fish Wednesdays. The first step was a reconnaissance mission to the store. Instead of usual walk to the store, I decided to drive to TJ’s – I was out of honey and I could make a detour to the people who have a cabinet of honey outside their garage. Put the money through the slot, take a jar. Then, of course, TJ’s didn’t have rice noodles or ginger or an acceptable piece of tilapia. They had exceedingly cheap, frozen tilapia from China. In my head I heard a little voice, much like I expect Pam’s to sound, telling me, “tilapia is a fine fish to eat – if it’s US farmed. (US and Canada farmed fishes are often okay, it’s the SE Asia farming that’s not so great. )” Oh, right, she did say that. I just have no idea what her voice sounds like. So I set down the $4/lb fish, make a quick detour next door for ginger, came home to unpack my loot, and headed to New Seasons. As usual. There I found a “good” farmed fillet from Ecuador and the all-important rice noodles. 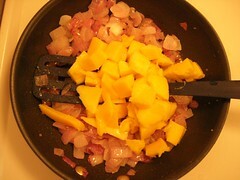 I sautee my red onion, grated in some ginger, tossed in cubed mango, and sprinkled some chili oil. Once this had cooked down a bit, I threw in the tilapia and sort of buried it under the mango and onion. Once it started the flake, I tossed the lot over some rice noodles. Despite the warning on the bottle, the chili oil wasn’t all that hot (and I’m a girl who buys mild salsa). I started out cautiously, adding more and more until finally I had my plate in front of me and began dousing the finished product. Maybe it’s because I didn’t add much ginger, but I couldn’t taste much beyond the mango. Still, it was tasty and unlike any other fish dish I’ve made. And, since today is all about the overhead shots (apparently), here’s a gratuitous picture of my latest round of garden tomatoes. Oh, and I really recommend that you finish off the meal with a chocolate covered coconut fruit bar, to complete the tropical theme. Yesterday was the last lake day of the summer, and I never ever not once brought my camera to capture the fact that I was returning to the lake of my childhood, the lake where Jen and I once let ourselves drift in an inner tube until we were in the far, reedy corner and refused to put our legs in a paddle because it was too gross so someone had to fetch us. Besides, the lake isn’t all that photogenic. There’s a lot of shallow water, and some ducks, and lovely shade trees, and picnic tables. But there, that spot on the way out is where we once stopped to pick some kind of berry that must not have been poisonous because we’re still alive. And there are the paddleboats we begged our mothers to rent, probably the very same paddleboats, and the little shack selling sweets. The people who run the park have not updated their website to say what will happen to the park – drained, filled, allowed to turn into a West Nile haven – now that the dam that created it is removed/being removed. There are no signs at the park itself. But, chances are, that was the last lake day ever. People with kids are starting school, and that means that I have to get ready to start school at the end of September. My warning signal. Fortunately, the weather is finally summery again. The tomatoes keep ripening. The sunflowers won’t stop growing taller. I could still go play badminton in my parents’ back yard. Food and books, books and food, the story of my life. Or at least it’s all I write about lately. This morning I was overwhelmed by the number of tomatoes gathering on my table, and decided it was time to make a tomato sauce. Which I’ve never done before. 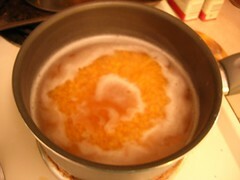 I let Betty Crocker be my guide, and figured with the next round I can try something more, oh, authentic. I cooked onion and garlic (twice as much garlic as Betty recommended, I’m not daft) in olive oil. Threw that in the crock pot. Added all my ripe tomatoes, chopped, plus a can of tomato sauce. 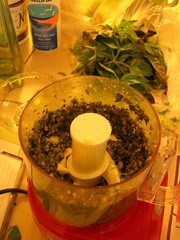 Generous lashings of basil, oregano and parsley. If I’d been thinking, I would’ve blanched and skinned the tomatoes, but as Betty called for canned whole tomatoes (blasphemy) I forgot until it was too late. 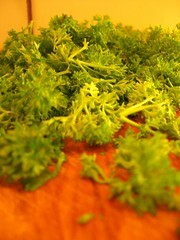 Oh, and fennel. It’s currently doing whatever it is things do in the crock pot. 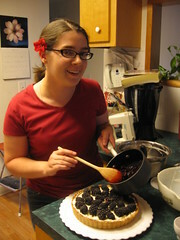 Then, of course, the next order of business was to bake a chocolate cake. Last week, for a coworker’s birthday, I tried this sheet cake from BabelBabe (I want to call her BabelBake when I refer to her recipes) and it was a hit – gooey frosting, hint of cinnamon in the batter. And easy – no mixer or extreme arm strength required. But of course I only ate my one piece at the birthday interlude, and have been drooling over the thought of it ever since. So I made another today, but split the batter into two 9×9 pans (instead of one 13×9) figuring I can take one into work and keep the other. Any minute now I’m going to go cut into one and devour it. This morning I finished reading At Large and At Small: Familiar Essays by Anne Fadiman, she of Ex Libris and The Spirit Catches You and You Fall Down fame. Quite pleasant. I made sure to drink my morning coffee while I read the coffee essay. Sadly, I didn’t manage to time a bowl of ice cream to the ice cream chapter. And lest you think it’s all delicious comestibles, there’s a dose of Arctic explorers and Romantic scandals as well. Now I’m finally on to Roller Skates, by Ruth Sawyer of The Way of the Storyteller fame. Okay, at least in my circles that amounts to fame. It’s a lovely hardcover copy that cost my library all of $3.77 in 1967. Ah, library binding. Nothing lasts quite like you do. I’m reasonably sure I read this as a child, but I have no recollection of it. It will serve as the next installment on the Book Awards Reading Challenge – Newbery. August has been decreed Rice Month. While the thought of rice doesn’t cause me to swoon in quite the way of pastry, I’m still a fan. Plus, hey, it’s cheap. This week’s recipe, Lentil and Rice Salad, cost me a total expenditure (as I had most items in my pantry, we’re not counting previous costs) of $1.29 for a bunch of parsley, of which I used a small fraction. Let’s not talk about the cost of making pesto, shall we? Yesterday was a bit of a food extravaganza, in more ways than just cooking and eating. Let’s start with the cooking and eating part. I have to confess that I’ve become an inveterate alterer of recipes. I used to make fun of those commenters on recipes, and while I haven’t gone so far as to actually comment with my alterations, this blog is coming dangerously close. As the recipe didn’t mention a particular kind of lentils, I decided this would be a good opportunity to try those cute red lentils I bought long ago and never used. So, while the rice cooked, the lentils simmered until soft. They got a bit mushy, those little red guys, and turned exactly the color of my wall. But once drained, cooled, and tossed with the rice, the mushiness wasn’t a problem. I couldn’t find scallions at the store, but I knew I had a leftover red onion that was languishing, so I chopped that up finely and used it instead. I accidentally bought Italian rather than flat-leaf parsley, as I didn’t notice until I got home that the recipe specified. I also seem to have mislaid the dill I thought I had, either that or it got lost in the wilted vegetables in the crisper. Hey, that’s what the compost bin is for. So I added a bit of dried (my dill has long since gone to flower, or seed, or whatever it is dill does). While the rice and lentils were doing their cooking and cooling things, I made pesto. This multitasking made the whole process feel much more complicated than it really was. 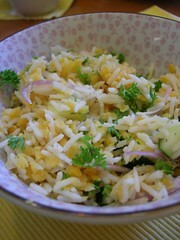 The recipe is fairly simple and adaptable and really only takes as long as it takes rice to cook and cool. But my counters were covered in pots and heaps of things to take to the compost and piles of basil leaves and shreds of parmesan and the cutting board was festooned with parsley, onion, garlic, and lemon pips. I took Di’s advice (it was her pesto recipe, after all) and am trying freezing the pesto in an ice cube tray. I should take those out today and throw them in a freezer bag. Perfect for individual thawing. Then I threw the salad together and took the pie crust out of the fridge to soften a bit. 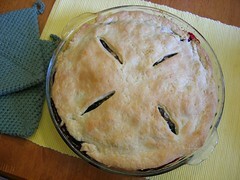 (Oh, did I mention I made pie, too? I made the crust on Sunday, to save time Monday, and so it was quite refrigerated by the time I was ready.) The final change I made with the salad was to leave out the cherry tomatoes. 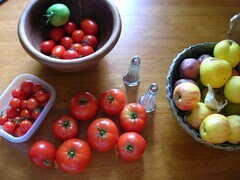 Several reasons: 1) I completely forgot – I was going to grab a couple from the garden. 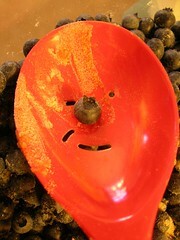 2) I didn’t really feel like eating cherry tomatoes – I’m not the hugest fan. 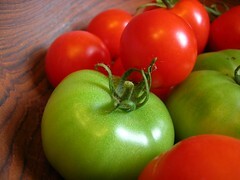 Which you wouldn’t know based on the number of cherry tomatoes plants in the garden. 3) There weren’t really enough ripe for a whole salad, and it feels unethical to buy tomatoes when I have SO MANY plants. 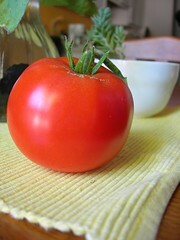 Speaking of, did I ever show you my first tomato? I literally gasped with delight the day I found him. He deigned to be eaten over the course of several delicious grilled cheese and fresh tomato sandwiches. Now, finally, here’s the salad. Then, it was on to the pie. A comedy of errors in which I remembered why pie crusts strike fear into my heart. None of the July Pastries that we did were two-crusters, so I thought I’d conquered pies. First, the pie crust always seems to be a hair too small, no matter how much elbow grease I put into rolling (I must admit, I love the rolling part). Then, I made the mistake of pre-baking the bottom crust so it would crisp up a bit and not sog under all the blueberries. This was good in that it worked (no sog) but bad in that it made it difficult to do the whole tuck and pinch routine with the top crust. So I just shoved the edges down as best as I could without burning my fingers. Then, of course, it was nearly impossible to get foil to stay around the edges. There were several tense minutes there. But the end result was mighty tasty, so I suppose it was all worth it. I used the Betty Crocker recipe, with butter in the crust instead of shortening, and with nutmeg added to the filling. It’s calling my name. Pie for breakfast sounds very Farmer Boy, doesn’t it? The last pastry hurrah. And goodness, did they go out with a bang. The hardest part of this recipe was the crust, and that’s not saying much. Actually, the hardest part was probably picking the berries. Unlike Bronwen, I had no trouble tracking down amaranth flour. From Bob’s Red Mill to New Seasons to Me. Not cheap, but easily acquired. I also picked up the mascarpone, a few things of butter (they have a store brand organic butter now, and boy is that the yellowest butter I’ve ever seen), and some ice cream (unrelated). It was an all-dairy shopping trip, except for the flour, but I quickly acquainted it with the butter so all was well. I blended the pastry, chilled it for an hour, rolled it out. No matter how much I flour my counter, pastry sticks to it. I’m wondering if it’s the heat or that my tile is weirdly absorbant/sticky. I resort to a spatula to pry it up. I found that it did roll out quite nicely though, no cracks. Laid it in my tart pan (I used one large pan instead of 4 small ones and found that the quantities worked nicely). From thence I bore it forth to my parents’ fridge, where it rested for another hour or so until Mom relented and let me bake it. In the meantime, we ate a delicious feast with three kinds of sausage, two kinds of chicken, two kinds of potato salad, stuffed zucchini, and a ratatouille. I also went out into the garden and scavenged for berries. About half were boysenberries and half marionberries, and I could be seen practically laying under the low bushes looking for hidden berries. I believe I also sustained a few scratches. While the crust cooled, I whipped the cream, then blended the mascarpone and a bit of sugar and vanilla. I forwent the vanilla bean on this occasion, and I can’t say I noticed its absence. The whipped cream was duly folded it and the entire concoction spread in the shell. At this point, were I to relive this experience, I would’ve chilled everything for half an hour or so to firm up the cheesy insides. Some of the berries were simmered with sugar and water. I would omit the water since the berries gave off plenty of juice on their own. Can you see where I’m going with this? 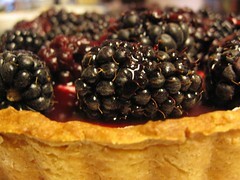 Everything was messy once the tart was cut open. This in no way compromised the flavor, instead encouraging me to eat up forkfulls that had fallen away from the main tart. 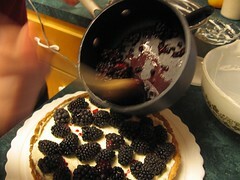 Finally, the fresh berries were arranged on the cheese, and the sauce was poured over top. For the first time, we see the pastry chef at work. Verdict: make it again, pronto. Good for serving it all immediately since it’s messy. Fairly simple. Amaranth in the crust gave a delicious nutty flavor and a fairly sturdy crust, worth the trouble. Easy peasy to assemble at the last minute when a crowd is roaring for its dessert, especially when you have a crust ready to go. I’m listening – or trying to listen – to Charles Frazier’s Thirteen Moons. I got through the first disc, and I told myself that I would make a decision at that point. The kid, I can’t even remember his name, is setting off to be indentured to a shop keep. He’s camping out and killing snakes and fending off bears. I could care less. But, it’s well told and read. I appreciate the old-fashioned turns of phrase and the feel of the thing. I just don’t know if I want to bother getting into it. Yesterday I picked up Miranda July’s No One Belongs Here More Than You. At least I think that’s the title. Just like with the movie she made, I have a hard time remembering the precise wording of her titles. Short stories, which never quite hook me as well as a novel, but they’re intriguing. Since it’s due back in 3 days, it got bumped up above Kavalier and Clay temporarily. Di’s comment about chocolate bars did nothing to abate my cravings. The chocolate malt I had yesterday was a temporary fix. As, I suppose, are all consumings of chocolate. How is it that I have no chocolate in the house? There is cocoa, and unsweetened baking chocolate, yes. I could bake something or make pudding (mmm, pudding pops). But I just want to bite into solid chocolate. The tomatoes are growing apace, although still completely green. But it’s heartening to take the compost out and see them all hanging out together. The sunflowers have also done nicely. I would show you pictures but for some reason they’re reluctant to upload. Tuesdays are lake days so of course that means it starts raining today. Of course I love the rain, but couldn’t it have waited until tomorrow? So instead of driving east, I have ample time to empty the dishwasher and clear out the sink and take out the compost and sip my coffee at the table instead of in the car. I finally finished the curtains, back when it was hot and muggy and ironing was a royal pain, and I would offer you a picture, except it turns out curtains aren’t very photogenic. You’ll have to come over and see. Nothing fancy, but they break up the Whiteness of the Wall (like the whale, get it? Oh, hush, I’m listening to The Secret of Lost Things and have Melville on my mind). Un Lun Dun was ultimately a bit underwhelming. Fun and clever, but no need to rush out and read it. I wouldn’t describe myself as a fantasy fan, but as it turns out there are a bajillion children’s fantasy books that I love. I’ll eat up Tolkien, CS Lewis, Lloyd Alexander, Madeleine L’Engle, Susan Cooper, Patricia Wrede. It goes on and on…but it’s either got to be quick and fun and to the point, a clever morsel, or you need substance and a sense of the profound. Un Lun Dun wasn’t either – it was far too long to be a clever morsel, and although it might have tried for substance, I really doubt it. It was full of characters and situations that begged to be recounted, but the plot and pacing felt off and the substance was absent. It was like trying to eat a giant meringue for dinner. I finished Serve it Forth the other night – it was very pleasant digested a chapter or two at a time, and I still have a huge chunk of The Art of Eating left to work my way through. Recommended for people who like to think about and read about food. Speaking of food, even my humblest tomato plants are working to put fruit on the vine, with the baby plant in a pot offering up a single crinkled green tomato and the larger plants hiding a multitude behind their lives. Hopefully they won’t all ripen on the same day. I was going to try, per Di’s suggestion, cutting back the watering on the most mature to force them to ripen, but the rain has squashed those plans. I pulled out most of the dill to make more room, but left a few stalks to go to seed and give me more dill next year. I’m thinking about braving the wet grass to go pick more blueberries while it’s cloudy. 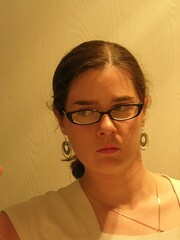 Oh, and I got new glasses. A bit reminiscent of my grandmother – the one whose vision I inherited – but not as severe. (I ought to scan a picture.) They will, I hope, give me amazing shushing action at work.